The Lenormand Bouquet is also known as the Flowers. Moving from the transformation and endings of the Coffin, we enter a time of happiness and joy represented by the Bouquet card. Gone are the burdens of change and the sadness of letting things go. Now we can enjoy ourselves and the good times around us. We might receive an unexpected gift or an invitation to a party. Whatever comes is certain to be enjoyable. This card is a green light to have fun and do what makes you happy. Take time to smell the roses and appreciate life. 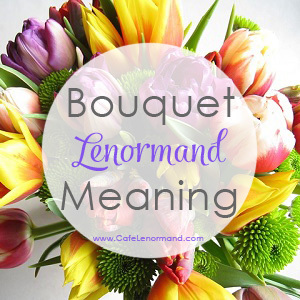 The Lenormand Bouquet Meaning in Love: In love readings, the Bouquet is a sign that something good is going to happen. It’s a sign of a happy relationship that’s blossoming as it grows. The Lenormand Bouquet Meaning for Career: In career readings, you can rest assured that all is well. Any problems should resolve in your favor. A great opportunity may be coming your way. The Lenormand Bouquet Meaning in Health: Traditionally, the Bouquet is a positive card in health readings. It can indicate good health. If there has been an illness, improvement should occur. Using the Bouquet for Timing: The Bouquet Lenormand card means September, Spring, 9 days, 9 weeks, or 9 months. With the Mountain or Lily, it can mean over 9 months. Celebrate! You’ve put in the hard work and now it’s time to enjoy the rewards. Are you sharing your talents and skills with others or are you hiding? You’re about to receive something wonderful. Are you taking advantages of the opportunities before you? Scythe and bouquet meaning for career is the same?